If you visit my blog on a semi regular basis, I run a feature Sunday SIL: Stuff I Like. Basically, I share items in my collection and give a little story about it, the personal connection I have or the history of how came to possess it. I planned to get this post up yesterday, but parenting comes first, so I apologize for the delay. Now, as you see in the subject line, this is most definitely stuff I am not fond of. Also, you see the key words "Tis the season". When you put those two ideas together, you should be able to deduce that this post will be another giveaway for you all to gain. Oh? Think you are so smart you can teach this class, do you? So what goodies am I dumping today? I will tell you I have two boxes of cards, all that I have minus the few that moved me enough to keep them. 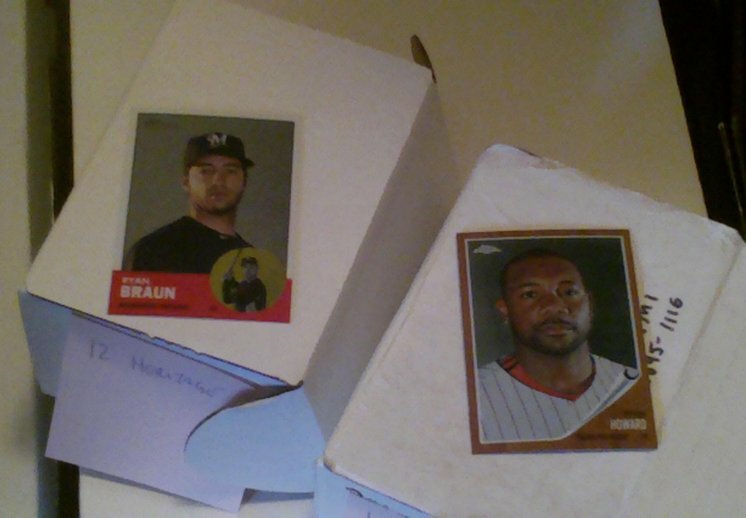 Both these sets are from 2012, and both set harken back to earlier sets released by Topps. I am talking, of course, of Heritage and Archives. Man, I SO did not like these sets. The Archives were some really crappy thin card stock, and the bright white did not work with many of the designs. The Heritage? The photos sucked. The ads in the photos sucked. The trademarks on the cards sucked. It sucked. I don't want these in my storage boxes wasting space. Two decent sized boxes. You see a Ryan "steroid-user" Braun refractor on the box of Heritage, and a 2011 Topps Chrome refractor of Ryan Howard on the Archives. You will get those cards as well. Yes, that Howard isn't from the Archives set, but I needed something with a serial on it that looked cool. All about the style, baby. Just like the Ginter boxes, you need to make a guess of the serial for each box. In the comments, list "Heritage - #" then "Archives - #". Over or under - I don't care. Closest wins. The Braun is numbered to #1963 and the Howard numbered to #1962. ***EDIT** - I forgot to mention - you have until Dec 22nd at 11:59pm. I'll announce the winner on Sunday. Guess correctly and you could be the big winner. And the rest of you? Well, we all can't be first. It's just how the world was created.